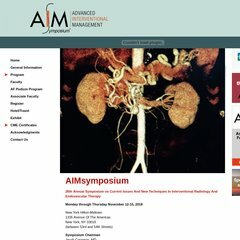 Topics: Program, Faculty, Hotel/travel, Exhibit, Cme Certificates, and Acknowledgments. Its 2 nameservers are ns2.webscope.com, and ns1.webscope.com. It is hosted by American Registry For Internet Numbers (Virginia, Chantilly,) using Apache/2 web server. It is written for PHP/5.2.14 language. PING www. (69.64.70.9) 56(84) bytes of data.